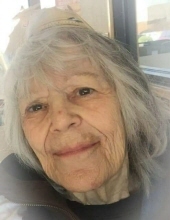 Eleanor Lancaster Smith, 82, returned home to our Lord and Savior after a long valiant fight against cancer on January 27, 2019 at 7:40pm at Kitty Askins. She is survived by four sisters Inez Vail, Faye Massey, Louise Howell, Grace Howell, two daughters Debbie (Ron) Berry, Glenda (Wayne) Ketchuck, one son Mark (Susan) Davis, four Grandchildren Gary Bell Jr. (Nikki), Sherry (Larry) Lane, Jason (Darlene) Gibson, Jason (Crystal) Hamilton and several Great Grandchildren. Visitation will be held at Seymour Funeral Home Friday, February 1, 2019 from 1:30pm - 2:30pm with a graveside service following at Wayne Memorial Park at 3pm. In lieu of flowers memorials may be sent to Kitty Askins Hospice Center, 107 Handley Park Ct., Goldsboro, NC 27534. To send flowers or a remembrance gift to the family of Eleanor Lancaster Smith, please visit our Tribute Store. "Email Address" would like to share the life celebration of Eleanor Lancaster Smith. Click on the "link" to go to share a favorite memory or leave a condolence message for the family.